I’d forgotten how great that machine is, so I got a real kick when I take across this today! 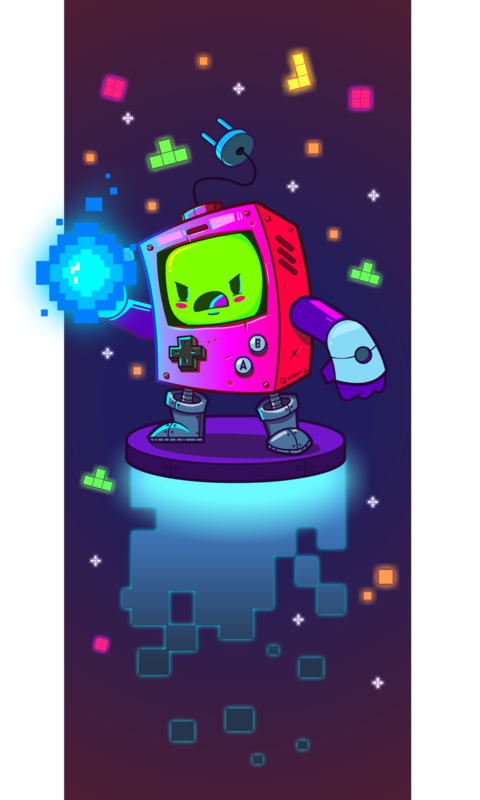 Gamerboy is a great piece of art by Mike Stafleu and captures the time of the Game Boy’s launch perfectly! See more of his stuff here. 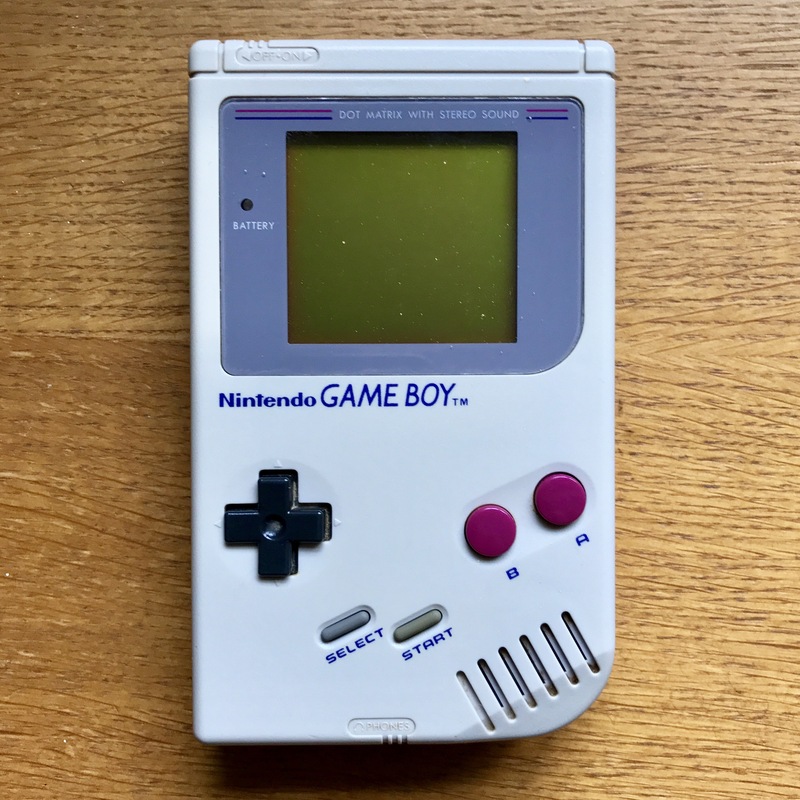 It is with great sadness that I announce the passing of my Game Boy, bought at launch in September 1990 and serving me faithfully until the 11th May 2017. This photo was taken moments before it went to its final resting place. In the bin. Actually, it was pretty much ditched when the Game Boy Advance appeared in 2001, which in turn survived two years (together with the ridiculous light attachment that made it vaguely playable) until I picked up the Game Boy Advance SP. The latter is still regularly dragged out of the box it shares with a fortune’s worth of the old huge cartridges and the later more sensible form factor ones – not convinced the screen brightness is what it used to be though, even with the backlight on. I remember buying the original at a computer game exhibition as soon as it launched, though I’m not sure my memories 100% tie up. 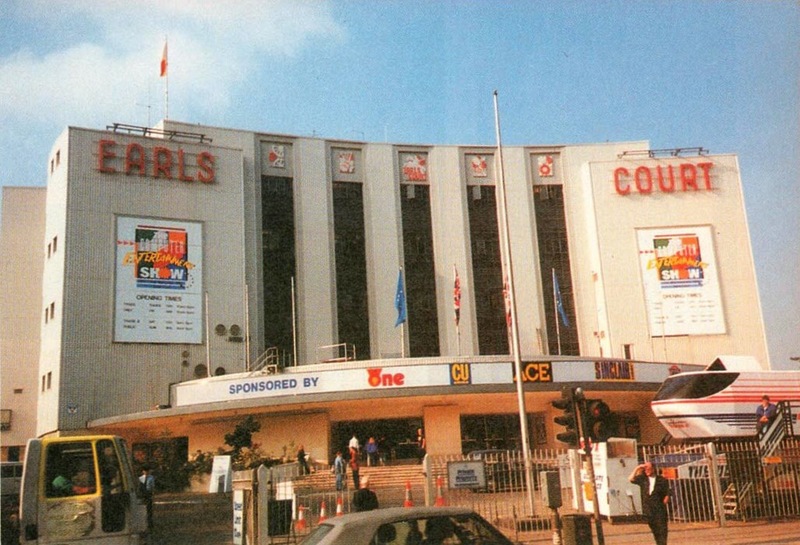 I had in my head that it was in London’s Wembley Arena, though a bit of detective work seems to suggest it was more likely ECES (European Computer Entertainment Show) at Earl’s Court, which took place in September 1990. Who knows. Who cares! Though if anyone can shed some light on it I’d be mildly interested. I do, however, vividly remember playing Super Mario Land on the train home. And, of course, the bundled classic Tetris. And invade my dreams it did! Or more specifically, those moments before you fall asleep… Blocks falling, lines forming in your mind! This was probably one of the last games I’d consider myself truly great at – Match Day, IK+, Kick Off, WWF Smackdown and this were games I can say I mastered. By the way, if you’ve never listened to their podcast, do yourself a favour! Very intelligent, well-researched, in-depth, non-pretentious chat on a single game per episode. Fantastic group of guys and girls, and the first podcast I ever felt a compulsion to do a monthly Patreon donation for! Here’s a gaming confession… I’ve never truly loved a Mario game. Except maybe Crazy Kong on the VIC 20, which was a knock-off and therefore didn’t even feature Mario (aka Jumpman). I’ve been playing Mario Run on the phone for six months solid, but that’s more addiction than love! It’s not to say this wasn’t a great game though – side-scrolling platformers have just never been my thing, and it’s perhaps testament to what a great example of this genre Mario Land is that I played it so much. I’ve already written a lot of words on Tennis (and my early days with my Game Boy). As mentioned in that post, this is a game I put more hours into over a longer period of time than almost any other game I’ve owned. No fuss, simple presentation, perfect gameplay. The best tennis game on any platform ever! It’s incredible that autocorrect on my phone changed WWF to WWE! In retrospect, this was pretty basic. Five wrestlers (Macho Man, The Hulkster, DiBiase, Warrior and Mr Perfect), all with pretty much the same moves, and you simply had to beat the other four in a row to become champion. But it was so much fun, especially when you picked Savage or Warrior! As with many earlier games, this was one where you filled in the gaps and added your own complexity, creating storylines and feuds in your mind… where Savage always came out on top in the end! I think I got this for my birthday in 1991. It arrived in the post while I was at lectures, needed a signature, and resulted in one of the few times I skipped lectures the following day to plod into Hatfield’s miserable town centre to pick it up. Despite the title, I’m fairly sure this was a kick-boxing game! You trained at the gym then selected from a list of increasingly difficult fighters until you reached a championship fight. It was realistic, the AI was good enough that spamming buttons didn’t work, and once you’d reached the higher levels it was very fast and very tough! It took a while, but I got to the final tournament and that was probably the last time I played it. This time around you had six sports-entertainers (Hogan, Savage, The Mountie, Sid Justice, Undertaker, and Jake The Snake), but almost as importantly as finally being able to be The Undertaker on the go, there was a steel cage match! There were also (a few) more moves and more modes, including tag and one-on-one matches, so those imaginary feuds could really come to life! Winning the championship after beating down your opponent enough to get up and over the cage remains a classic gaming satisfaction! As alluded to elsewhere on these pages, I once put together a list of my top 50 games. Kick Off came in at No. 2… I also mentioned my mastery of Kick Off just a minute ago… But you can be sure that neither of these facts have anything to do with the Game Boy version of this football gaming masterpiece! Believe me, I wanted to love this game so much; I’d being excited about (not for – I’m English) this arriving on the Game Boy more than any game since I’d heard Kung Fu Master was coming out on the Spectrum! Admittedly, it wasn’t as bad as that shocker, but it definitely wasn’t the monochrome version of my greatest love on the Atari ST either! There was no excitement, little skill required, and everything was too big and up close. I remember playing it lying in bed at university for hours and hours in the hope that it would eventually click, but despite my best efforts to not admit money I didn’t have not being well spent, it never really did. I’ve also written about Kung-Fu Master extensively on these pages, but the Game Boy version was a very different game, written ground-up for the system. The principle is similar, as are the simple punch-kick controls (though you did have a backflip too), but rather than ascending a dojo like in the arcade game, your traversing varied levels, including dodgy cities and a great moving train, taking out goons and bosses with chainsaws and other heavy weaponry. Unlike the aforementioned Spectrum disaster of the same name, the controls are responsive and it all ends up being a really fun handheld brawler. Gauntlet was one of my great loves on the Spectrum, but this was the first time I’d ever played a sequel. You’ve only got two characters, but otherwise everything has been squeezed into the Game Boy, including speech from the arcade version, which is a remarkable achievement. Masses of monsters, the maze-like dungeons, the chests, the keys… it’s all present and correct, and was far more detailed than the Spectrum ever managed with the original! 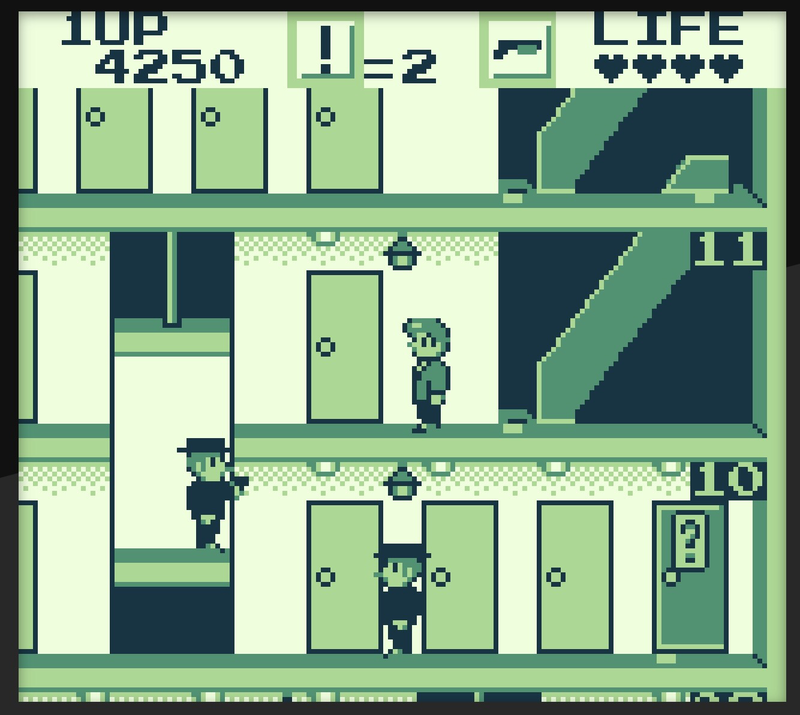 This is one, like Tetris, Elevator Action (see below) and Tennis that I still love to play to this day. I actually bought this one in 2010, having never realised that one of my all time favourite arcade games even existed on the Game Boy! Everything is intact, the graphics are detailed and full of character, and the duck and shoot gameplay feels just like it did when I first saw my next-door neighbour drop a 10p into it at a local sports centre many years earlier! Classic game and fantastic conversion – who’d have dreamt you’d be carrying this in your pocket when you were gulping Dr Pepper after the roller disco in 1983!